As I mentioned earlier that you may use both self-signed and third party issued certificates so I will show you that how to create both. In Oracle Fusion Middleware 11g stack, we use keytool utility for certificate management. Keytool utility gets shipped with JDK installation itself. 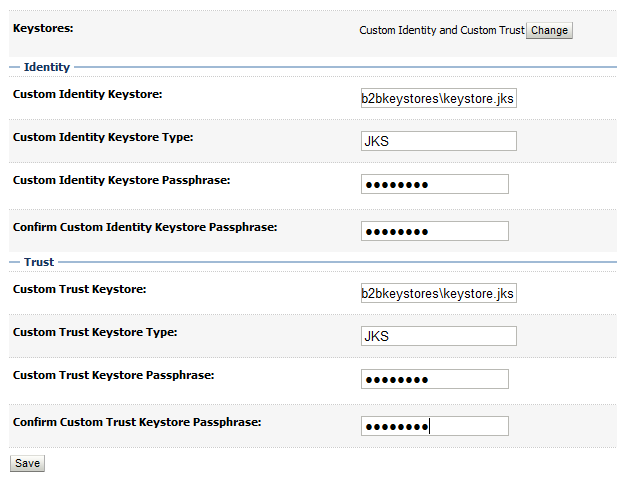 Above command will create a keystore with name “keystore.jks” and it will add a self-signed key-pair in the keystore. You may directly use this self-signed certificate or may get it signed by a third party CA. Note that the PEM (Privacy Enhanced Mail) format is the preferred format for private keys, digital certificates, and trusted certificate authorities (CAs) and the preferred keystore format is the JKS (Java KeyStore) format in Weblogic server. Remember that when you use the Keytool utility, the default key pair generation algorithm is Digital Signature Algorithm (DSA) but WebLogic Server does not support DSA so specify another key pair generation and signature algorithm when using WebLogic Server. Here we are using RSA (which stands for Rivest, Shamir and Adleman who first publicly described it) algorithm. Make sure to take a backup of keystore because once it gets lost/damaged, then you will not be able to recover it and remember that CSR can be imported back into the same keystore (or in it’s backup copy) only after getting signed. e) Once you get the signed certificate back from third party CA, you have to import it into your keystore along with the certificate of CA who signed your certificate. Convert the CA certificates and signed certificate received from CA, into PEM format and store them in the same directory where our keystore is (D:\b2bkeystores). As there may be a chain of CA certs so store each and every certificate of the chain, separately. where “rootCA” is the alias of this certificate and “rootCA.pem” is the file which contains the Root CA certificate. Now repeat this step for each and every CA certificate in the certificate chain with different and meaningful alias each time. Above command will create a file with name “serverCert.cer” which is actually the public certificate of your server which you may share with your Trading Partners. h) Now import the certificate of all your Remote Trading Partners along with their CA certificates, in the keystore we created. First of all store your TP’s certificate and their respective CA’s certificate in separate files in PEM format (as we did in step ‘e’). After that import all the Root CA certificates (if any) with different alias and then import all the intermediate CA certificates (if any) with different alias and after that import the certificates of all your TP’s with different alias, in the keystore we created. Repeat this process and re-run the above mentioned importcert command for all the certificates. 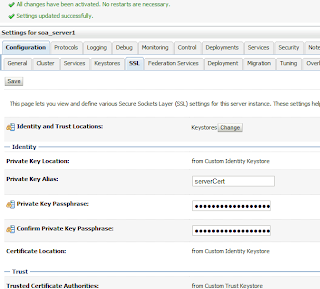 Now we have to configure the keystore we created on, SOA server. Open the Oracle Weblogic Admin console (by default http://localhost:7001/console) and login into it. 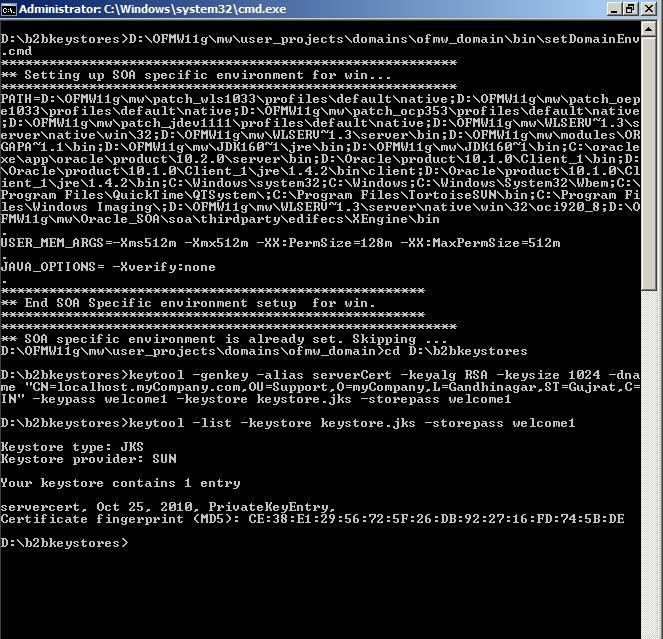 Go to Environment --> Servers and click on the SOA server name (by default soa_server1). 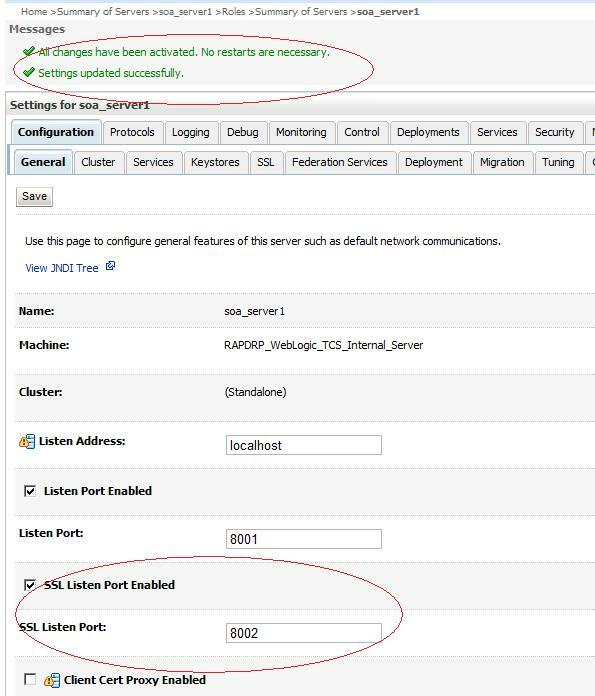 Select the checkbox against “SSL Listen Port Enabled” and provide the value for “SSL Listen Port” (by default 8002). Now click on “Save” to save the changes. 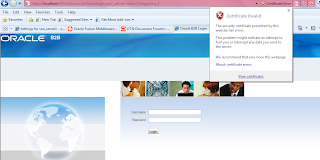 You may see a warning related to certificate on IE if your certificate has not been signed by a trusted third party CA and you have not installed it yet on windows. You may safely ignore this warning. You are done with the configuration and guess what, you may now use message security and transport security with Oracle B2B 11g!!! Hi - I am unable to access my webapplication hosted on weblogic 11g, using Internet Explorer. FireFox works just fine. I always had 1 confusion while sharing our certificates with trading partners. I got my certificated signed, imported RootCA and all other intermediate certificates.Now should i export my server certificate (alias) and share with trading partners. Or should i export my RootCA (alias) and share with partners. Ideally you should share both CA certs and the leaf server cert but if CA is a well known third party CA like Verisign or Thwate then your partner may already have their certs so in that case you may share only your server cert's copy. 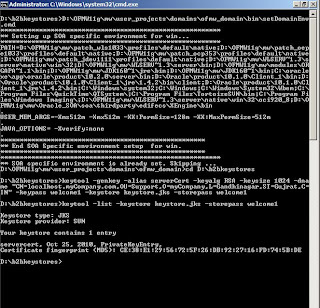 While saving the Channel setup in b2b, the channel saves but with Error: Fail to access key store.Cannot recover key. The Security information allows me to access the keystore and choose both the Digital signature and Encryption certificates? Why do I get this error? It seems your private key password and keystore password are not same and that's why you got this error. Make sure that both private key and keystore have same password. We are doing ebMS 2.0 B2B and trying to use Digital Signature. I created an outbound channel and managed to specify alias serverCert in the Digital Signature security. We are currently getting an error receiving the TP message and complaining about validation error. My assumption is that it was using the serverCert to validate the signature, not the rtpCert. I created an inbound channel in which I want to specify rtpCert in the Digital Signature security. Is this the way to explicitly specify to use the TP public key as the key to validate the message? Are you getting a signature validation error? 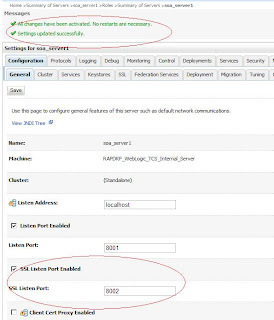 From configuration perspective, you should create one ebMS 2.0 channel under remote TP configuration (channels tab) and select appropriate certificates there. Add this channel in the inbound agreement you create. B2B will take care of using appropriate cert at runtime. If you still face issue, please raise a thread on OTN B2B forum and we may discuss it there in detail. Very brief post ! Read it thoroughly and found it interesting one. I just read it and try to implement it on oracle on my system and I did everything without single error. It is only because of you..Thanks dear..you are genius. You post is very useful. I would like to ask one question where i don't get any answer. How can I convert .cer file to .pem file using keytool utility. I guess answer to this question can solve my entire certificate issue. @How can I convert .cer file to .pem file using keytool utility. Easiest way is to import the cer into IE by installing the certificate and then export it back from IE in Base64 Encoded format (again .cer file will be created). Just rename the exported Base64 encoded file to ".pem". All the certificates which are Base64 encoded can be opened in notepad and you can see their text content (ASCII) which starts from "-----BEGIN CERTIFICATE-----" and ends with "-----END CERTIFICATE-----". You may also use Firefox to export in PEM format. If you are looking for a tool then use OpenSSL. How can generate cerficates in Cluster environment? Do I need create 2 Certificates, one on server1 and one on server2, if so how we configure the b2b. Please help me ASAP. Anuj, your articles are so well-written and easy to follow. They are quite possibly the best that I've ever seen. You use your expertise to make a complicated subject simple and you have the skill to be able to communicate well to others. I'm very impressed and equally grateful. Keep up the good work! I am very novice to B2B. I was asked to create custom XML via AS2 exchange protocol in B2B 11g for a trading partner. Can you please explain me what needs to be setup for accepting AS2 messages in B2B. I am getting the below error after i added the keystore loation and password .Can you please suggest on this . Could you please suggest me , is it possible to receive mesages from TP to B2B host over Generic HTTP channel over Http, messages are reaching to b2b but, its not identifying the Agreements and Document. pushing messages from tp to Host (http://localhost:8001/b2b/transportServlet) for custom XML..
My Trading partner is trying to send the messages and it is being timedout .Thay are asking me to give the username and password for the URL .When i created the keystore i didn't add any username or password .How can i give the username and password to them .How to enable the authentication ? Is there a way to implement 2 way SSL with Oracle B2B. The keystore password which we update in B2B console is getting cleared whenever we bounce the SOA, is there any solution to make it permanent or do you think we are missing something in our configuration ? Very helpful article ! I was always curious about all these complex algorithms that are being used in these ssl encryptions. I am using Oracle 12c (SOA Cloud Service) for Oracle B2B. 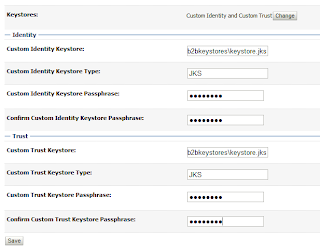 As per their documentation I created following stripe and keystore - kss://B2B/WD - in KSS. I also imported Trading Partner Certificates in this keystore. The Trading Partner is sending message encrypted with my public key certificate. But on receiving the message, our B2B is not able to decrypt as it is not able to find the private key in the keystore - kss://B2B/WD. It generated the new-store.p12 file. But I am not able to import the same in the KSS store. Am I doing the correct thing here. Still I am not able to import this new-store.p12 file in the kss://B2B/WD keystore since EM console is asking for alias name in the drop down and in drop down no alias name is present.